I have a bad habit to share. As a college student, every semester prior to the start of classes I go through the joyous process of ordering overpriced textbooks that I may not even utilize depending on the class. During this process I have a tendency to add some extra goodies to my amazon shopping cart. I know, it's not exactly the most frugal practice, but it's one of the only ways I have found to remain sane. Somehow, my anger lessens at my $100 management textbook when I also find something fun in the box. 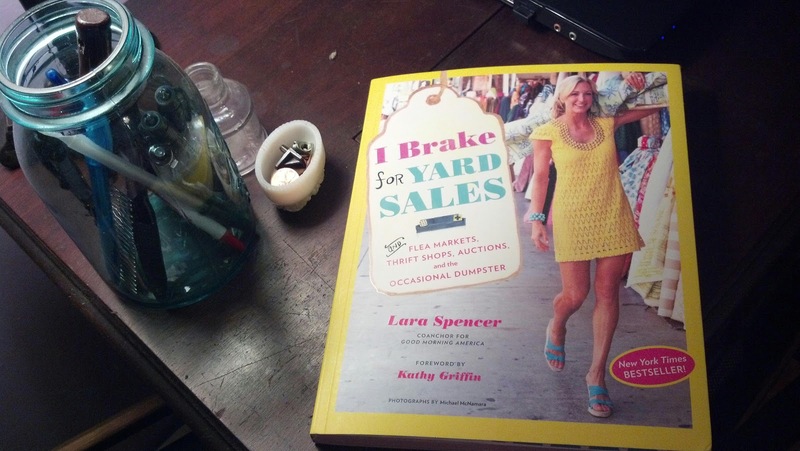 This year I purchased season one of Mad Men and Lara Spencer's book I Brake for Yard Sales (and Flea Markets, Thrift Shops, Auctions, and the Occasional Dumpster). Intriguing title isn't it? Well tonight I finished my cover-to-cover read of the book and figured I'd put a little review of it out in blog-space. Overall, I must say I enjoyed it. 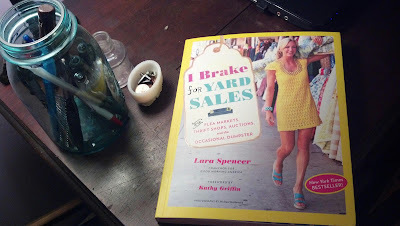 It got me rather amped up for the summer flea market season and widened my view of possible things to search for. I must also note though, that as a seasoned flea market attendee (I have been going at least every other weekend since I was a child), I found very little "new" tips in it for me. Throughout the book there were some very interesting before and after pics that I found to be intriguing as well as some good "finds" of her's which she shared. My only real issue throughout the book wasn't so much with the content, but with the general style featured. It was focusing far more on the modern mid-century style (think Lucite, faux bamboo, and chartreuse) than I tend to prefer. Generally I'm more of a shabby country gal. As said though, this really was a fun read and filled my time when I didn't really have the time to get involved with a full novel. If only the "blue-bloods" were mentioned less, *sigh*. Although I won't be incorporating Lucite into my decor any time soon, there were a few things featured throughout the book that I wouldn't mind finding in the thrifts. Now onto my next read...well re-read...Safe Haven by Nicholas Sparks for the second time before the movie comes out. Hmmm....I love lucite! I might have to purchase this book! Thanks for posting! No wonder you ordered that book - the title alone would've been enough for me. Thanks for the review ! I'm so happy you all enjoyed the review, thanks for reading! I'm glad to see I'm not the only one intrigued by the title!